This is a follow-up to my earlier post about today’s earthquake and tsunami in Japan. I wrote my previous post on my cell phone during my lunch break, so I couldn’t provide many details easily. Unfortunately, I had to work until 9pm, so I couldn’t learn more about the disaster until now. 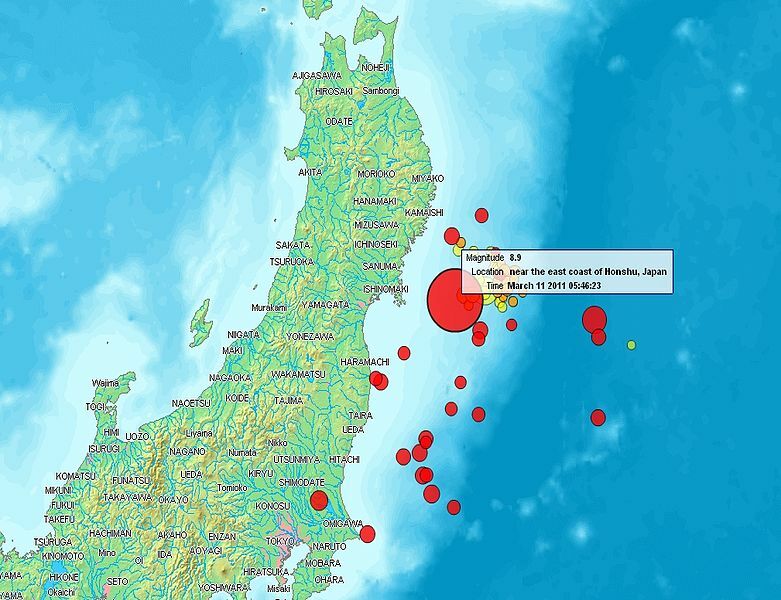 At 2:46pm today, an 8.9 magnitude earthquake hit northeastern Japan. It hit around Sendai – there’s already a Wikipedia page about it! According to that page, this has been named the “2011 off the Pacific coast of Tohoku Earthquake” (東北地方太平洋沖地震 /tōhoku chihō taiheiyō-oki jishin). Just to give you a rough idea of the distance, the epicentre was about 400km north-east of Tokyo, and I am about 215km south of Tokyo (I think!). This map doesn’t even show Hamamatsu (in Shizuoka Prefecture), where I live, which shows just how far away I am from the main area that was affected. Still, we did feel it here and some of the nearby coastal areas have been evacuated due to tsunami warnings. The earthquake triggered a tsunami warning for many countries, not just Japan (as I write this, it is reaching Hawaii, but seems to have lost some of its strength, which is good). At 3:50pm a 10-metre high tsunami hit around the Sendai area, and seems to have caused most of the damage. The BBC has a detailed report on the earthquake and tsunami here. 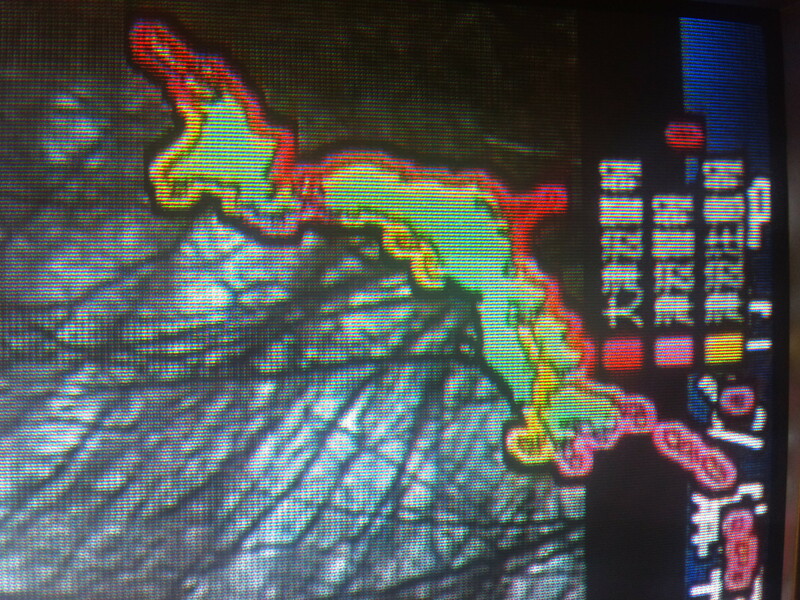 They are saying that it is “the most powerful earthquake to hit Japan since records began“. The live coverage video on the BBC site shows some really shocking images of cars, boats and buildings being swept away by tsunami waves. I can’t even comprehend what I’m seeing when I watch it – it’s like everything is just being engulfed. When I switched on the TV here, every channel was reporting on the disaster and every channel had some variation of the map below, which shows (I think) the areas most at risk of the tsunami. The number of dead and injured hasn’t been confirmed yet, but reports I read said at least 300 bodies had been found. It’s just awful. As I write this, Kyodo is reporting 88,000 people missing. (UPDATE: This number, which I got from Kyodo, seems to have been largely over-estimated. Reports are now saying 500 – 600 people missing.) A passenger train has been derailed and another is “missing”. Many people are stranded in the Tokyo area, unable to get home because the trains have been stopped. Some people have started trying to walk home, and convenience stores are reported to be giving out free bottles of water to aid them on their journeys. One of the problems Japan is now facing is the risk of damage to the nuclear power plants. There is a power plant in Fukushima, about 270km northeast of Tokyo, in Onahama City. Reports say the plant is not leaking radiation, but 3,000 residents have been evacuated within a 3km radius, and those living within a 10km radius were told to stay home. A “state of atomic power emergency” has been declared. Japan is a country which is well prepared for earthquakes. Buildings are designed to wobble instead of come crashing down. 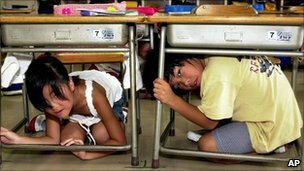 Kids are trained at school and learn what to do in the event of an earthquake. In fact, small earthquakes happen almost every day here. But nothing like this has happened in Japan before. However, since the Kobe earthquake in 1995, authorities have been preparing for the next one and improving procedures in the event of another earthquake. Reports I listened to on the BBC said that Japan should be much better prepared this time. When I spoke to my students this evening, people seemed generally calm about the whole situation (whereas my American co-worker and I were pretty much freaking out!). Anyway, this was supposed to be a concise summary of the current situation in Japan, but I’ve rambled on because as I’ve been writing I have been listening to live news reports on the BBC and replying to concerned messages from friends and family (thank you!). So I will leave this post here, and just say that my thoughts are with everyone in Japan today – not just those in the affected area, but also those living elsewhere, who are perhaps worried about friends and family. If you are worried about someone that you can’t get in touch with, you might want to try the new Google Person Finder Tool. Hamamatsu Shizuokaken, Japan 431-3102 I hope her family and all are safe. I look forward to more posts to let me know how Hammamatsu is doing. I live close to there and everything is totally fine in this area. The quake was only around a level 3 here. People in coastal areas have been evacuated due to the tsunami, but I think everything is ok in Hamamatsu. Thank you Ali for the information. I will continue to monitor the news from the USA and hope for the best for all the people in Japan. Blessing to you. Arigatou! (my spelling may be wrong). thanks so much for this post. it was very insightful. i have a friend in Hamamatsu and i was worried about how close he is to the danger zones. but thanks to your map i feel a bit better now. i talked to him earlier today and he said he would write me back after he calmed down. So glad to find your blog- have not heard back from any of my friends in Hamamatsu. We lived there for three months last fall while my husband worked at Shizuoka University. So glad that the situation seems fine. I live in shizuoka too – in Hamamatsu. Whereabouts does your brother live? I heard that some coastal areas had been evacuated, but as far as I know there have been no reported problems in the Shizuoka area. There was plenty of notice here, unlike Sendai in northeastern Japan. I hope you brother is ok, and am sure he will be. Thank you so much for this information. I have a friend in Shizuoka and have been concerned for her and her family. I haven’t been able to reach her yet. She lives at Nakacho-Okitsu, Shimizu, Shizuoka. I’d be grateful for any information you have on that area. Thanks again. Our thoughts and prayers are with all the people of Japan. My brother works in Hamamatsu too. I hope he is fine. I am in the Us-California and have been hearing many reports on tsunami waters entering miles interior/fire breakouts/nuclear plants failing. I can’t imagine why Mother Nature is punishing Japan by all means. I wish my bro can fly out asap from the nearest airport. I am very scared of any blackouts that may cause disruption in communication. My heart goes out to all who are affected. I don’t need to check on any friends or family, but wanted to ckeck on you. I stumbled across your post on Kanzanji a while back and after I heard about the quake I was hoping you were ok. Glad to hear that you are. Take care. That’s so kind – thank you! I’m totally fine. I have a host family that live in Daito-cho area in Shizuoka. Just want to know that area have been affected by tsunami or no? Hopefully everyone of my host family is safe. Thanks. I’m sorry, I don’t know that area. But as far as I know there have been no reports of any problems in Shizuoka Prefecture. Hello our friends live in Fujinomiya-shi (Shizuoka) do you know how is the situation there?Thank you! I’ve not heard of any problems there. I have friends there too. Thank you so much! 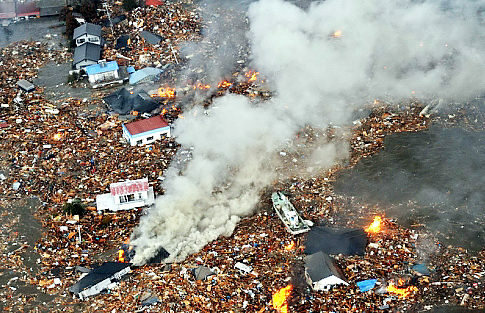 We will keep on praying for Japan.God bless you! What a wonderful act of kindness for you to have this blog. You have touched many peopel. Thank you so much Haikugirl for writing. I’ve been worried about a friend of mine who works at Shizuoka University. And after reading your posts now know that I can relax. You’ve done a really good thing here. All the best to you! I’m glad I could help to reassure you a little. i have friends that live in shimada-city, shizuoka. i’m assuming that area is ok too?? i have not been able to reach them at all since thursday. can you confirm that everything is ok in that particular area. thank you so much for your help. i’m very glad that you are ok.
As far as I know, the whole of Shizuoka Prefecture is fine. I hope your friends get in touch soon. I have family members in the Shizuoka area, not sure though exactly where but does anyone have any info on this area. Another question is where was the most severe damage and destruction? Hi there – please see my latest post: https://haikugirl.wordpress.com/2011/03/13/where-is-shizuoka/. This explains where Shizuoka is in relation to the most badly affected prefectures. Shizuoka Prefecture seems unaffected. I hope your family are ok.
I’ve got friends in Shizuoka and haven’t been able to contact them by phone. Also, I haven’t had a reply to an email, so I was starting to worry. Your update states that although tremors were felt in the Shizuoka prefecture, the city itself is OK. Has there been any tsunami activity there? I’m glad you’re OK.
As far as I know there have only been tsunami warnings here, but no tsunami activity. Some people right by the coast were evacuated but all tsunami warnings have now been cancelled, so I would imagine people are in their homes now. I hope your friends are ok and you hear from them soon. Thanks for this awesome page! im so happy to find this page> We have a friend that lives in Miyakoda-Cho Hamamatsu. I hope him and his family are ok. Havent talked to him and doesnt reply back his facebook mail. Any idea of that area??? I have a friend in Miyakoda too. As far as I know there have been no reported problems at all in Shizuoka Prefecture. I hope your friend is ok. Thanks for the update, I have been pretty worried about Hama, I lived there and also in Omaezaki, havent been able to contact friends. I feel this catastrophe and my heart goes out to all those affected. 神はあなたと一緒に! My English student ,while she and her family were in USA, lives in Hamamatsu postal, Aoi-Nishi. Your posts give me hope that are OK. Thank you Haikugirl . Hello Haikugirl, sorry to be yet another person asking the same. I have a friend living in Ikeshinden, Omdezaki, Shizuoka and was wondering if this area had been affected. I have watched the news for days with heavy heart. I was so gratfuly i found your website as i had tried the Find People in Japan website and had no luck. Unfortnuately i do not have any telephone/interenet addresses of my friend…only her mailing address. I have quickly read some of the posts and it would appear that the area is ok…but would still like some confirmation from you if you have the time. Thank you so much for your kindness, warmth and incite to appease worried friends that have no contact. It is greatly appreciated…you have a good soul. You and your family stay safe. As far as I am aware the whole of Shizuoka Prefecture is completely safe and fine. We are far away from the incident. I hope you can get in touch with your friend soon.